We've covered this issue in many ways, including the debates, the players, tips for easing debt, how debt is affecting young people's decision making and a lot more. But how did we get here? Who has profited most and how? The Center for Investigative Reporting and its weekly radio show Reveal recently dug deep into these questions and profiled people who've been affected. I reached out to CIR reporter Lance Williams, who co-investigated the story with journalist James B. Steel. Here's an excerpt of our conversation. 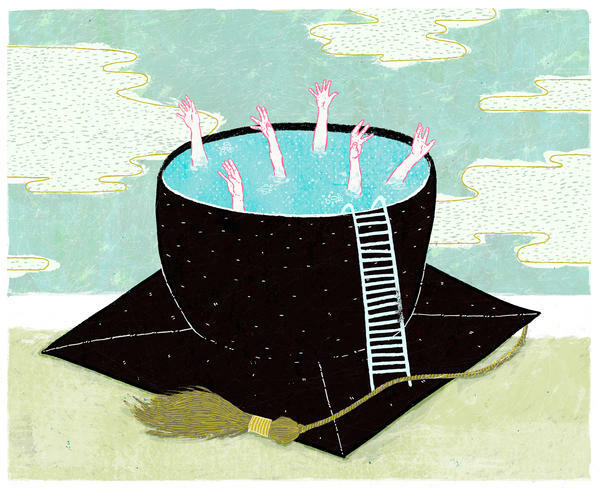 Let's talk about the student lending giant Sallie Mae. You report how the decision to privatize Sallie Mae in 1997 played a huge role in helping to create this debt crisis. Explain. Sallie Mae was a government-affiliated corporation whose board was made up in part of public officials. When it first came into existence, it was supposed to help create a market for the student debt that the feds were issuing. But after privatization, it became a full-service, for-profit corporation that really "verticalized" its involvement in the student debt industry, everything from issuing loans to running collection bureaus. The concern now is we replaced a program whose real purpose was to help people go to college with something where that's kind of a secondary goal. The primary goal, of course, for for-profit institutions is the bottom line. Privatization of Sallie Mae was a key victory for banking and financial industry lobbyists when the Republicans controlled Congress in the mid-'90s, yes? President Clinton tried to maintain his new direct-lending program, which made Uncle Sam the lender — not just insurer — of the loans. Yes. President Clinton wanted to take back the issuing of federal student loans. In the dust-up over that, he was forced to accept the privatization of Sallie Mae to get what he wanted. This was the [Newt] Gingrich Contract with America-era Congress. There was widespread suspicion that government can't do things efficiently and we need to get the private sector to roll up their sleeves and make this stuff work, and that's what we got. Suddenly, hedge funds, investors, lots of banks had a more direct role, not just in lending, but in the fees, services, in the collection. And Sallie Mae and other financial organizations began marketing private loans with higher interest rates and fees and with fewer relief options? Right. All of the functions of the student loan program originally were run by government agencies, bureaucrats, I guess you could say in a dismissive way, but they were not motivated by profit. They were there to make the program run. When you privatize collections, you get really aggressive companies that come in there and work really hard to get the money back. That's totally understandable in the corporate context. But we started this trying to help people get educated and get on with their lives. And now you've got thousands upon thousands of students who fall behind on their debt harassed from dawn to dusk, hassled, pushed hard, and in some cases even when they aren't in arrears on their debt, having to deal with all kinds of crazy stuff that's really in the name of a government program. You write that in the three-year period 2010 to 2013, when students began to shoulder more and more debt, Sallie Mae's profits were $3.5 billion. And the former CEO of Sallie Mae, Albert Lord, was instrumental in that. In your story, Lord says, "Look, it wasn't the private lenders that made this mess." He blames universities and the government. And universities, and state governments in particular, are not blameless here. Budget cuts led schools to raise tuition, and the debt burden widened. Doesn't Lord have a point? He does. There's been tremendous disinvestment in public higher education in our country. It peaked in the 1970s. Our reporting showed that if state legislatures had continued to support higher ed at the rate they were in 1980, they would have pumped an additional $500 billion, billion with a B, into state university systems. Interestingly, that's just about how much outstanding debt is now held by people who attended public colleges and universities. You see the symmetry. As the states disinvest, the burden is picked up by the students, and the way they pay for it is they borrow the money. We talk about the numbers and the policies and the politics a lot, but of course there's also the stress, angst and pain of having this massive debt burden hanging over your life. It can start to control your life. You talked with a 28-year-old named Jessie Suren who says "I'm a student debt slave." Tell us about her. Jessie went to elementary and middle school at the Hershey Academy, which is an institution in Pennsylvania to educate poor children. She had a mom but no dad. No one in the family had been to college. She wound up doing well in high school and going to La Salle University, a private school in Philadelphia. She borrowed pretty heavily. She had career aspirations, wanted to be in the U.S. Marshals Service. That did did not work out. Suddenly, she found herself spit out into a bad economy with some $76,000 in debt. Her life since then has been just scrambling to make the payments. Her mom co-signed some of the loans. An aunt co-signed some of the loans. She didn't want to get mom and aunt jammed up, and so she's worked as many as three bad jobs at a time just trying to keep on top of the loans. One of the most interesting jobs she had was as a student-loan debt collector. Yeah, she said she was working for the enemy. She went to work for a state agency in Pennsylvania. Her job was to sit in the cubicle, and they'd robo-dial the debtors and then she was trying to get some money out of them. She said, "This is going to be me in a couple of years." There are many Jessies across the country, as we now have 40 million Americans shouldering more than $1 trillion in debt. I think what's troubling to reflect on is we made reforms, the Obama administration has made some strides, Congress has made some reforms, and if you're borrowing money now, you're much better informed and you have much easier payment options that are at least possible for you. For people who've already got the loans, and that's all those 40-plus million you said, the relief is not really on the horizon. Your story really highlights that this isn't just some problem of people in their 20s and 30s as some might assume. You talked to retirees, professionals nearing retirement. It's affecting their life a long time after college, their retirement plans. Tell us a little about Professor Mary Franklin. Professor Franklin got a Ph.D. in special education and taught for many years at the University of Cincinnati. Borrowed a modest amount of money, I think under $25,000, to accomplish the Ph.D. She admits that she was not at all financially savvy and just has been paying the minimum on that loan ever since. She's now in her 60s, she got those loans when she was in her late 20s, early 30s, so she's actually paid the debt for her entire adult life. Just to show you how intense it can get, late in her career, she [became ill] and the wheels came off her life. During that period, before she found relief and got better, she wasn't even opening the mail at home. Of course, the student loan that she had been paying on for 25 years was not getting paid, and so she had these guys calling her up and saying they were going to go after her disability retirement check, which was all she was living on at the time. That's on a loan that had been paid on for many, many years. Let's talk relief. The Obama administration has taken some steps to try to ease the burden, including the rise of income-based repayment plans, capping loans at 10 percent of income, cutting the fees paid to private banks who act as intermediaries, among other moves. Any evidence that those changes are helping? I think they do. If you're borrowing now, you're going to have an easier time of it. The trick is trying to figure out how to provide some relief for two generations of Americans who have borrowed and haven't been able to pay those loans off. We met people whose Social Security was being garnisheed for student loans. We wrote about a murder victim whose estate was pursued for his student debt. You can't discharge this debt any other way than by paying it, really. It's almost impossible to use bankruptcy to discharge student loans. Once they've got you, there you are. As you write, the debt crisis is something of a microcosm of America's inequality. Today, the least well off often end up the worst affected. Couldn't this worsen income inequality for years, even decades, to come? I think so, because you're taking away people's ability to participate in the economy, buy a house, buy a car, have a family, and the debtor class is restricted from these things and the debt-free class is not. You can just see it happening. The other element of this, of course, is that low-income people, especially low-income people with no history of college education in their families, tend to be targeted by the for-profit universities. They're really their market target. You have poor people, perhaps unsophisticated about higher ed, loading up on private loans for an education that's supposed to bring them up a rung or two on the economic ladder, but end up dropping out and are stuck with $12,000 or more in debts and no way to pay it. What are a few potential ideas to help ease the worse-off? Reduce the power of these private collection agencies? Debt forgiveness? Further reorganization of Sallie Mae? Revolution? De-privatizing is a suggestion that we've heard that would at least take away some of the more intense and tough aspects of being a student debtor. If you could return collections and so forth to a government agency where the motivation is not to grab every last buck, that would take some of the sting out. The real issue is how can we help people by forgiving some of the huge debt they have, people, say, in their 40s who have already paid far more than they ever borrowed. What can we do to forgive that debt? That runs up against the tremendous expense it would be. Also, of course, the government makes money off student loans, makes a lot of money. By some accounts, there's a GAO report that says for federal student loans issued between 2007 and 2012, the government got $66 billion — billion with a B — profit income, revenue, off that over the life of those loans by the time they're paid off. That's a big chunk of money straight out of the general fund if you wanted to forgive it. Uncle Sam would feel that; they're making big money off this. They'd have to make it up somehow, yes.